Lampe Berger's L'Originelle is inspired by the first Lampe Berger designs (design "A Universelle", around 1905). L'Originelle Lamp, in translucent black glass, is decorated with raised glass diamond tips. 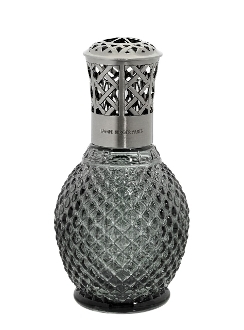 It has a Criss-Cross slotted top in metal with a weathered pewter finish, inspired by the first slotted tops, and engraved "LAMPE BERGER PARIS". L'Originelle black lamp comes in a nice gift box with burner, tops, funnel and instructions. Imperial Galleries recommends this lamp.